Moringa Ultimate, Super Fine Powder, contains 50 pouches, each pouch weighs 2 grams. This Moringa Oleifera Powder is a super fine moringa powder. There were currently no machines on the market that were capable of producing moringa powder so fine, so we had to invent and build our own machines to do it. Our Moringa Ultimate is so fine that it is practically water soluble (if you let it sit long enough some of it will settle out). This super fine powder makes this moringa powder so much easier to digest that the bioavailability of this moringa is even higher than our other moringa products. 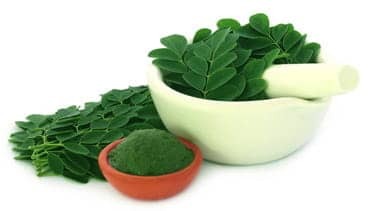 Our other moringa products are already the best in the world as far as bioavailability and potency are concerned, due to our advanced packaging and processing methods. But this Moringa Ultimate gives even more of what makes moringa the miracle plant even better. -100% moringa oleifera leaf powder (extremely fine moringa powder). To see a list of all the nutrition in our moringa click here. Inside the big pouch are 50 small pouches, each containing 2 grams of the Moringa Ultimate Powder. It is pre measured to eliminate confusion over how much 2 grams is. The big pouch is our antioxidation free package that blocks out 100% of light and is double-sealed in the resealable pouch with the oxygen absorber inside so it is in an oxygen free environment, not just air tight. This exclusive packaging prevents oxidation. Oxidation destroys the abundant nutrition in moringa. Amazingly enough, Moringa Ultimate, Moringa Powder even tastes better. 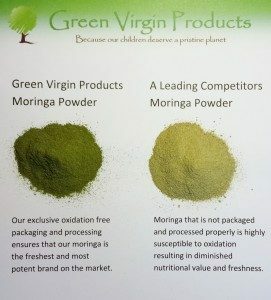 We did not expect it, but it tastes even better than our other moringa powder. It tastes great in fruit juices, and it is even pretty good mixed with water. Here are my favorite ways to drink it. Half purple grape juice and half orange juice, mix in 1 packet of moringa ultimate powder and shake well, delicious! Also, sweet lemonade, mix in 1 packet of ultimate moringa oleifera powder and except for the green color your kids or fussy eater will never even notice that the moringa is in there as lemon seems to totally mask the taste of the moringa. Another new favorite is mixed with apple cider; you'll love it. A note From Ken Marion the founder of Green Virgin Products: "I can actually feel the difference taking this Ultimate Powder. It just gives me a feeling of alertness all day. But since there is no caffeine in moringa, it is a calm alert feeling that I really like. I am so excited about this new exclusive product! I know you're going to love it too!" Your satisfaction is guaranteed. Order some now, we ship within 24 hours, usually the same day. How much should I take every day? The recommended minimum serving of our ultra-fine Moringa Powder is 2 grams per day for a 150 pound person. Each of the 50 packets equals 2 grams. These 50 2-gram packets give you the perfect amount of moringa powder to add to your smoothie or juice. The pure moringa powder dissolves quickly. They also make it easy to keep a few packets with you for moringa powder on the go. These special packages are designed and manufactured to insure the quality and freshness of your moringa powder wherever and whenever you want to enjoy it. -All the powerful nutrition of Moringa in a convenient packet! -Guaranteed fresh and potent every time!